Caitlin and Carrie from Table Talk with C&C are hosting a very exciting *TpT Best Seller Linky Party and Giveaway* this week. I am very excited to be donating my best selling writing activity for this linky and giveaway! My best selling writing product, with hundreds sold and a solid 4.0 rating is Primary Persuasive/Opinion Writing Unit Correlated with Common Core. This 57 page unit is aligned with first and second grade Common Core standards. 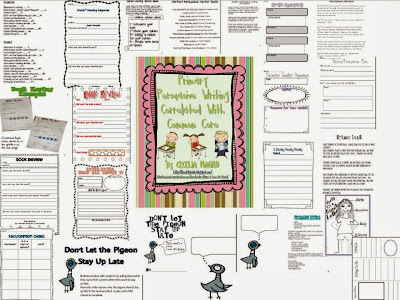 It includes book responses, book review sheets, opinion charts, fact/opinion chart, Don't Let the Pigeon Stay Up Late text innovation, opinion writing lessons, oreo organizer, planning sheets, prompts, friendly persuasive letter lesson, real world persuasive piece, list of mentor texts, mini lessons for adding details, strong leads and closing sentences. Don't look any further. This will cover all of the Common Core Standards! Hop on over to Table Talk with C&C to check out the fabulous giveaway and put in an entry.